I have to say that usher is looking real good in this picture, I'm just glad he decided to stop wearing those high top sneakers and boots, that ish was getting out of hand. 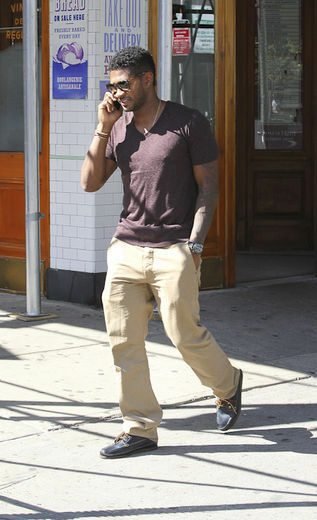 Now he looks grown up and about his business, keep it kool man. It must be a windy day in NYC, Beyonce steps out of her car holding her dress down, hmm IDK. But she looks real chill with her hair pulled back and not a ton of weave all over her head, take a note from your lil sis natural looks are hot. What the hell? 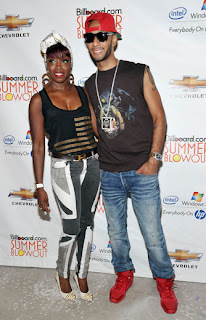 Estelle and Swizz attended the Billboard summer concert in NYC yesterday. Question why they both look like reject from a 80's rock band.